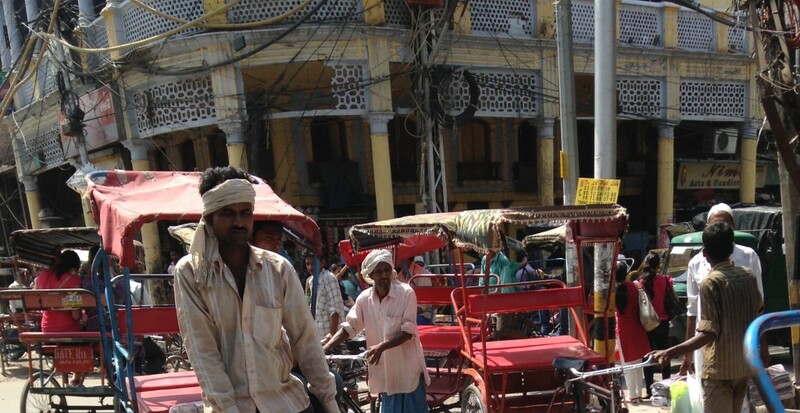 My first impression of Old Delhi was its men. Men everywhere. 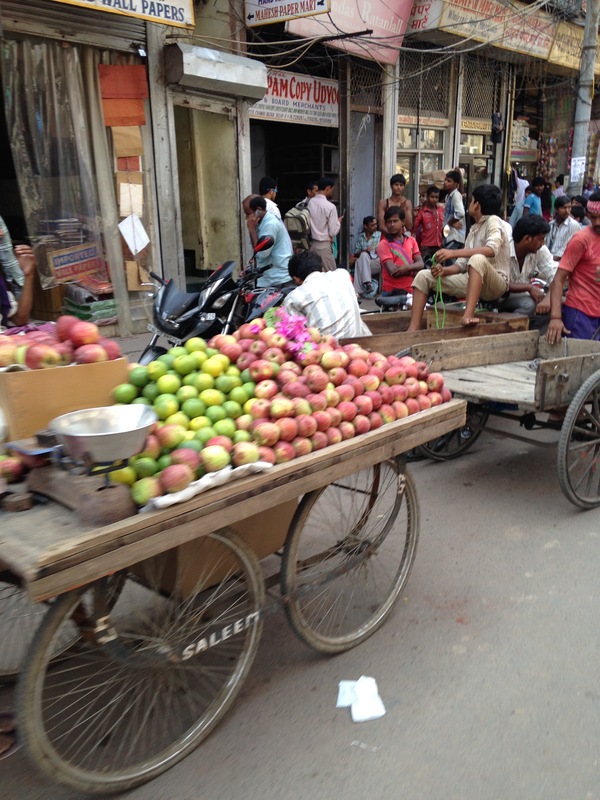 Historically, Delhi began as an ancient walled city founded by the Mughal Emperor Shah Jahan. Today, it exhibits only remnants of that period. But I was surprised by the high percentage of men I saw on the streets. Where were all the women? Quite remarkably, at least to my western eyes, every man I saw wore a trim and professional looking haircut. Western tradition has valorized the shaggy look for several generations, probably as defiance of class markers. Certainly the long hair of the ‘60s began that way, and likely the shadow beard and facial hair of the current fashion is similarly motivated. The brand new denims with factory-made wear and holes are more evidence of class blurring in the west. 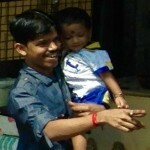 But in India the men wear their hair trim and neat, and if they have new clothing without holes, they wear it. Incidentally, all the younger men I saw wore western style clothing. Whenever I’d spot a traditional-style tunic-length shirt, what we used to call the Nehru jacket, it was worn by an older man. Too bad—I’ve always liked the look. 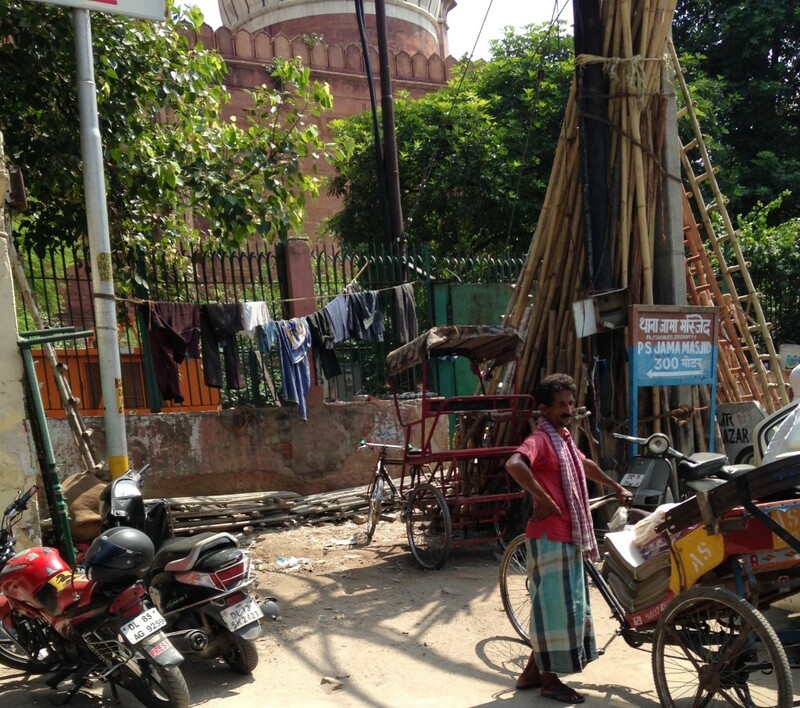 Many men on the streets were clearly plying a trade of one sort or another, or not, but a certain percentage of them lay sound asleep at the side of the road, curled up on the grassy areas of embankments, and sprawled underneath every shady tree. Everybody just walked around them. When we asked Anna, the tour director, about these men, she explained how men have to leave their families in the country when their agriculture-intensive labor isn’t needed and travel to the large cities for temporary work. The men asleep on the ground were not indigents, they were seasonal laborers with homes far away. These were men who worked wherever they could earn a wage. 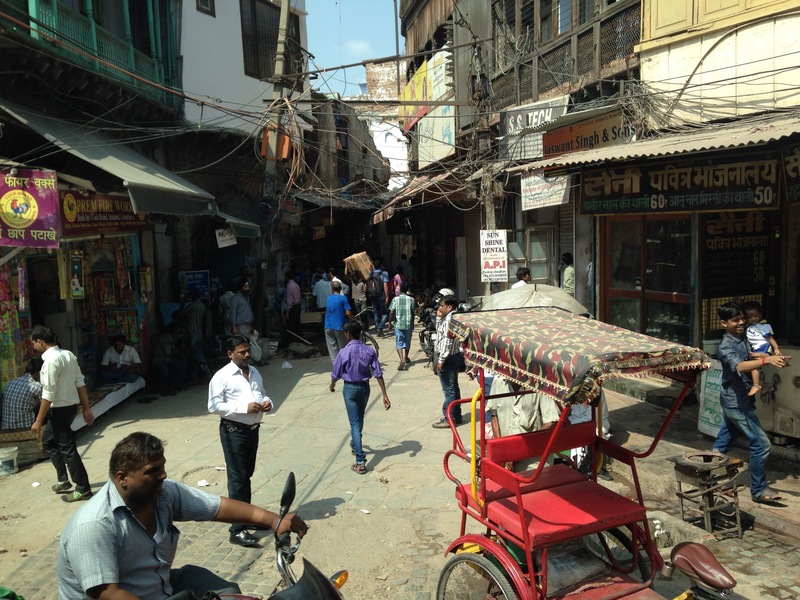 We traveled by cycle rickshaw along the lanes of Chandi Chowk, once the imperial avenue of Mughal royalty into the heart of Old Delhi. There’s something distinctly uncomfortable to me about a person doing physical labor on my behalf, or any other service, for that matter. 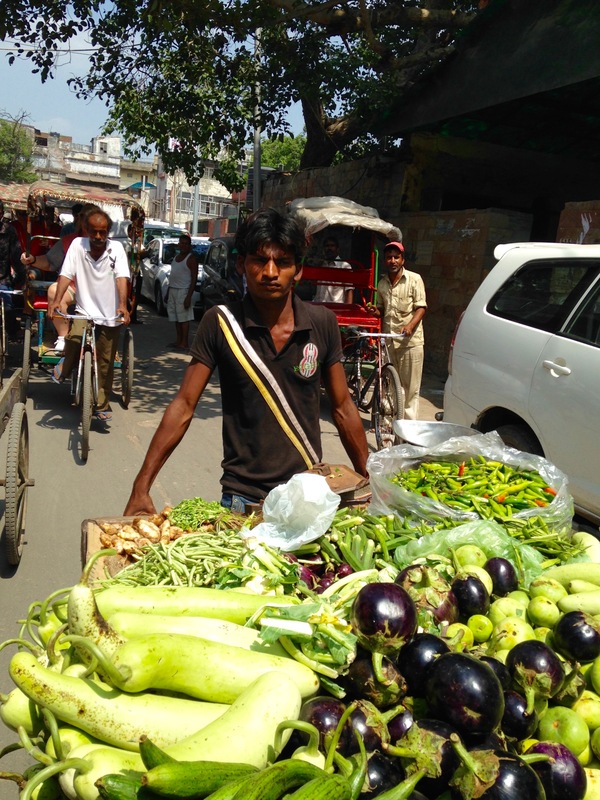 Maybe it’s a democratic impulse North-Americans imbibe like mother’s milk from birth that wells up in me, but I had to stifle an apology to the young man pedaling the rickshaw for how much work I was causing him. I was fascinated with the glimpses of the lives I saw. Over-sized tuk tuks transported uniformed school children here and there in Old Delhi, and one carried a group of young school girls. But otherwise, we saw very few females. 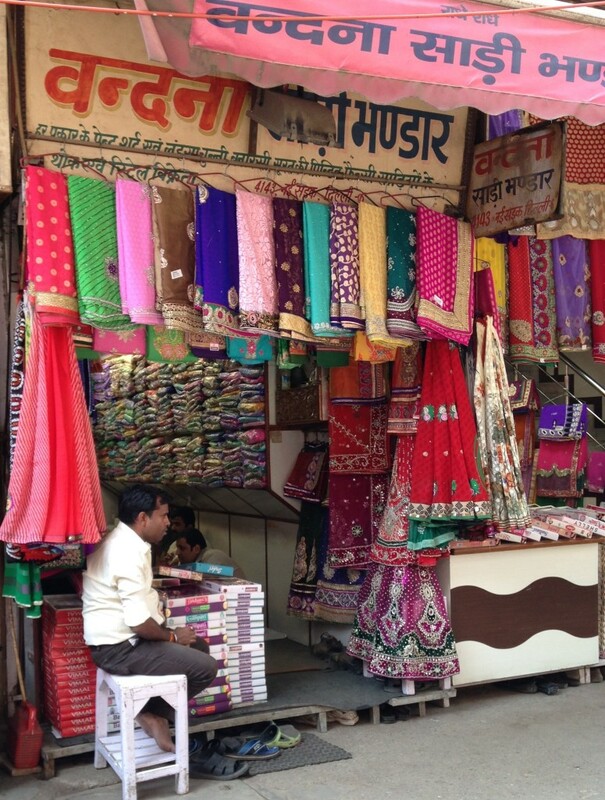 Many shops were filled with brightly colored textiles suitable for saris, so women had to be inside those buildings somewhere. I wondered what this man was thinking about as he waited for customers to buy the saris in his stall. There comes that blissful time in the fast-moving life of a tourist’s day called lunch. The world over, civilization marks a brief hiatus for lunch. And our lunch marked a fine introduction to the authentic cuisine of India—completely delicious. Indians do so many interesting things with a variety of spices that I could easily become a vegetarian if I stayed very long.